Hommage an den vergessenen Anarchisten Nestor Makhno als auch eine Liebeserklärung an die freiheitlich-libertären Ideale des Anarchismus. Freie Improvisationen fliessen ein in wundersame Songs, Heiterkeit und Witz gehen über in Melancholie. Phil Minton and Veryan Weston, friends for many years, wrote a vocal project for a six-member choir on the topic of anarchism back in 1993. In the middle of the project stood the life and work of the Russian anarchist Nestor Makhno. After many years of dealing with the content and music, however, the composers were led to create a reduced form, to a duo of voice and piano. 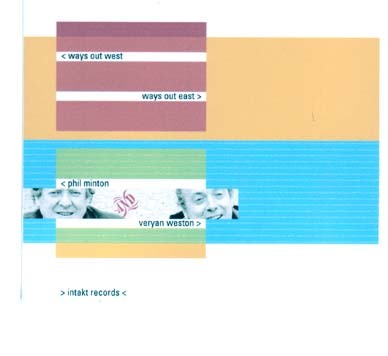 The duo CD Phil Minton – Veryan Weston, with the two parts, “Ways Out East – Ways Out West,” is not only a homage to the forgotten anarchist Makhno, but also a declaration of love for the liberating-libertarian ideals of anarchism. Free improvisation flows into wonderful songs, exhilaration and wit cross over into melancholy.